I can’t make it through the afternoon without at least two snacks. That’s absurd. I know I don’t actually need two snacks, but they really help me make it through long afternoons. I try to keep it healthy: a couple handfuls of nuts and dried fruit around 2 pm and a grapefruit, peach, apple, or whatever fruit is in season around 4 pm. If someone has devilishly brought cookies or brownies into the office to share, I cannot claim I’m always able to resist. No matter how many cookies I snag at the office, I try to keep the mainstays of my diet whole, low-sugar, healthy foods. I’ve been experimenting with Sucanat and natural sweeteners like honey and maple syrup. I’m not exactly ready to give up milkshakes, birthday cakes or delicious cocktails, not about to embark on a Whole30 diet, but I get it: our bodies can handle sugar only in moderation. The pancreas and liver get overworked when they’re constantly required to regulate and metabolize sugar. 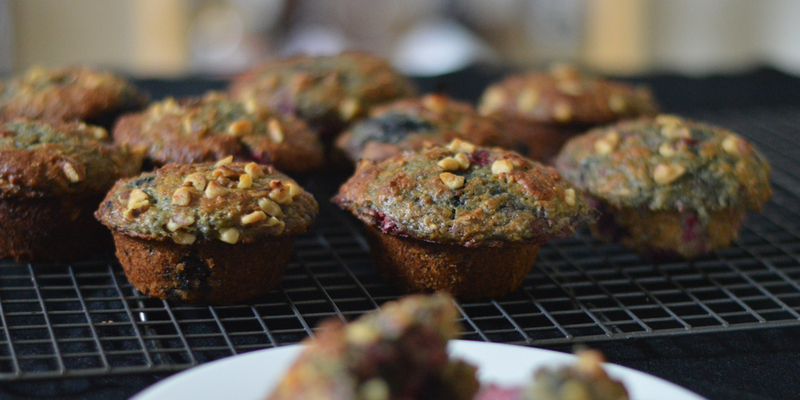 About twice a month I bake up a double batch of these muffins, stash them in the freezer (they freeze beautifully), and grab one on my way to work. I’m much more likely to walk past the brownies in the office kitchenette if I know I have a little baked good of my own back at my desk. 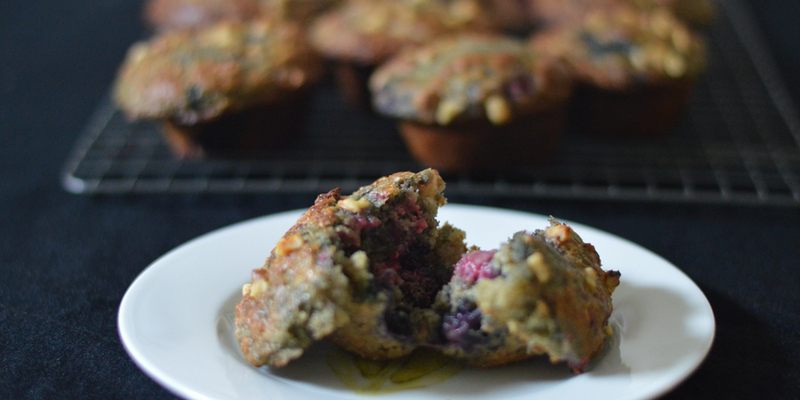 The sweetness of these berry muffins is derived mostly from the fruit. Though these are decidedly not sweet, we both truly do prefer these to the traditional buttery, sugary classic blueberry muffins (we’ve done a side-by-side), and not just because we know we “should”. Even Matthew prefers these to regular blueberry muffins, and he can eat a half pound of gummy bears or a box of Trader Joe’s jelly beans just on the ride home from the grocery store. The recipe below is adapted from Smitten Kitchen, via Sweetie and the Kitchen, via Table of Contents. The assembly in the other recipes is a bit more complex than my version (layering in the fruit separately); I was looking for something I could whip together with very little effort and fuss, but with delicious results. *¼ cup packed brown sugar can be substituted for the Sucanat/maple syrup combo (brown sugar is sweeter than Sucanat and maple syrup, so only ¼ cup brown sugar is used in lieu of both the other sweeteners). Heat oven to 425 degrees. Grease or spray a 12-cup muffin tin. Whisk buttermilk, egg, oil, Sucanat/syrup or sugar, vanilla, and zest in a small bowl or in stand mixer. Sift or whisk oats, flours, baking powder, baking soda and salt in a large bowl. Add dry ingredients to wet and give it just a few stirs. 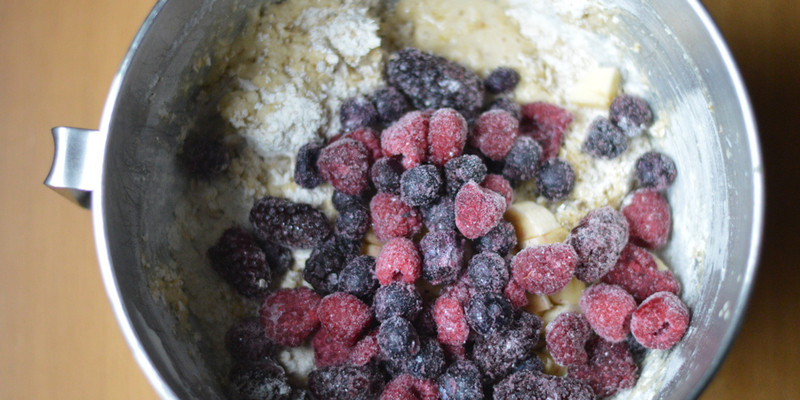 Add frozen or fresh fruit (and nuts, if using here) and fold together with rubber spatula until thoroughly combined. Do not overmix. 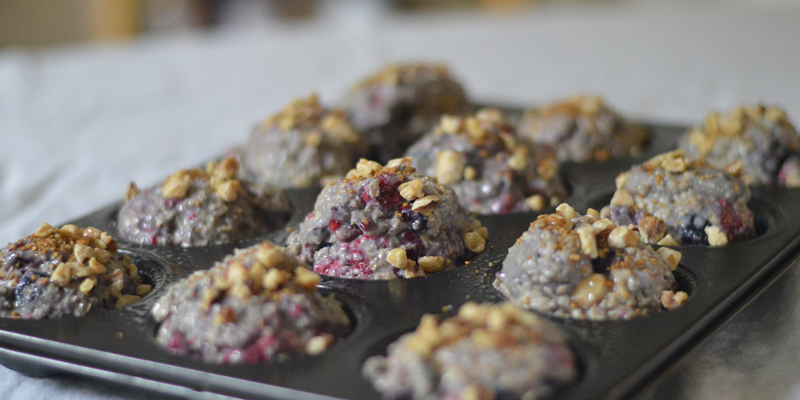 Spoon batter into prepared muffin cups (they’ll be very full, but I’ve never had them overspill while baking). Sprinkle tops of muffins with a pinch or two of turbinado sugar and walnuts, if desired. Bake muffins 16-18 minutes; rotating the pan midway through, until a toothpick inserted into the center of muffins comes out with just a bit of crumbs or fruit attached. Do not overbake. Cool in pan for 10 minutes before removing to cool completely on a wire rack.